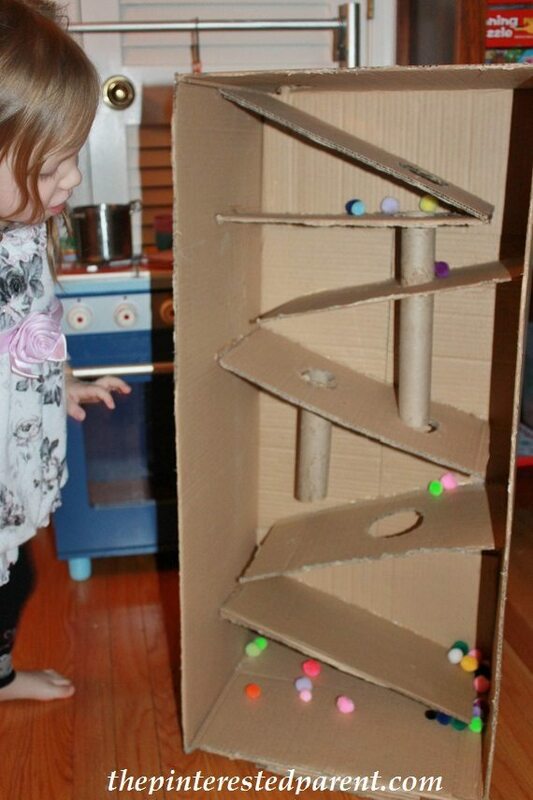 Kids love boxes. 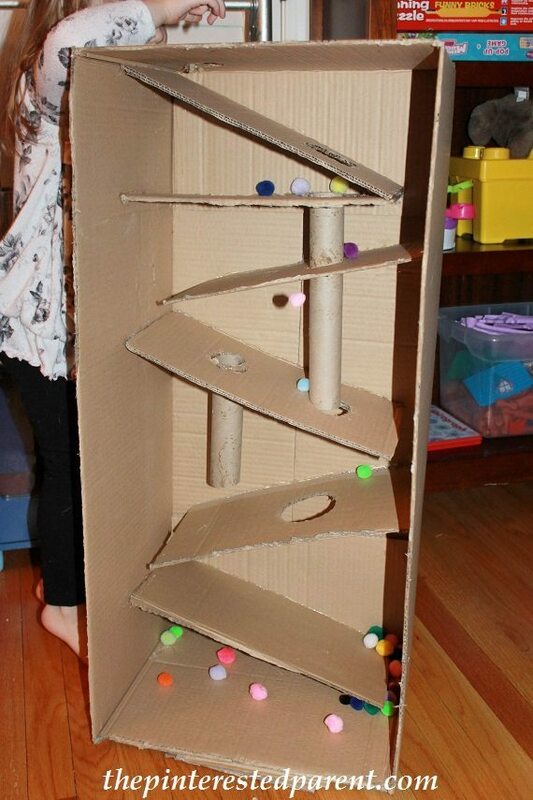 The larger the box, the more fun to be had. We are still in the process of getting our house unpacked after our move and have a ton of empty cardboard boxes. 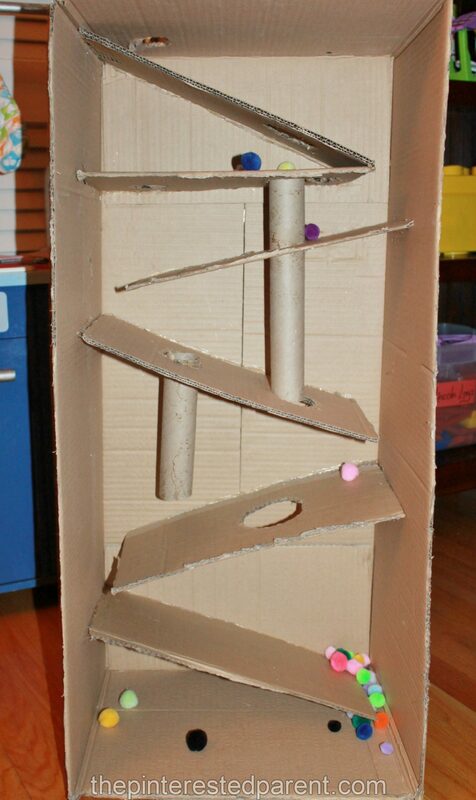 We have been having a lot of fun making things out of our boxes & the cardboard. 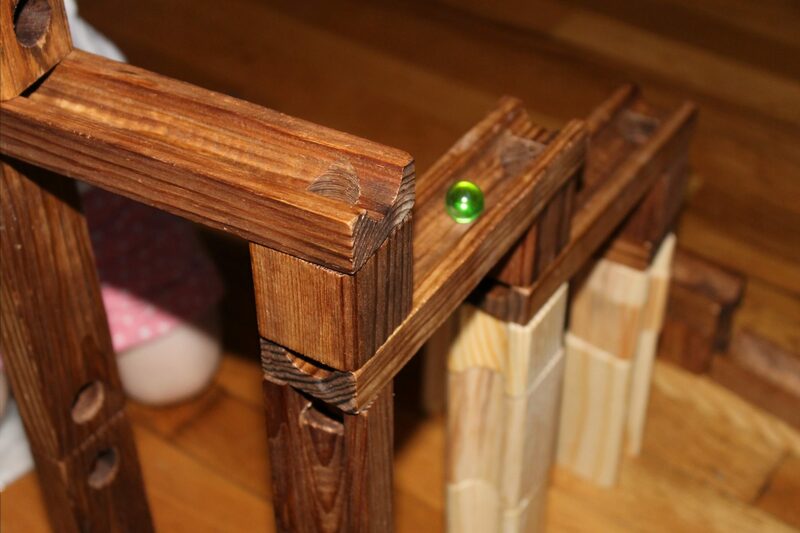 My daughter has a great building blocks marble run set. 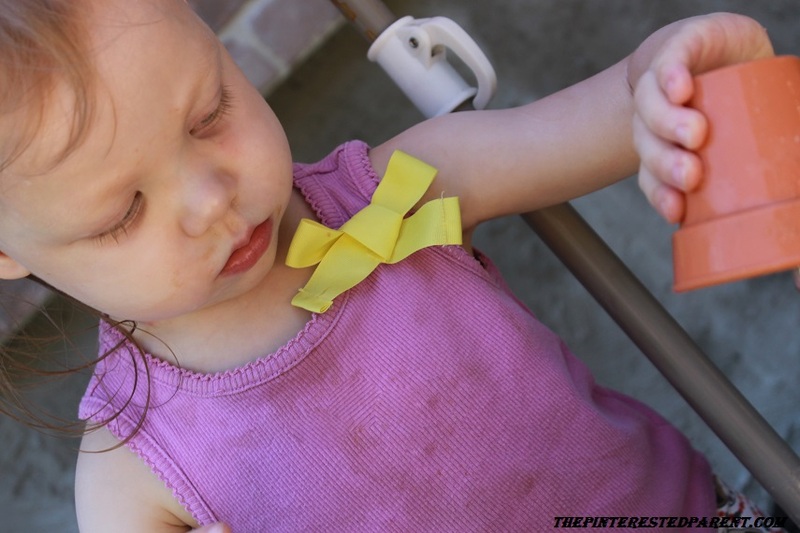 She used to play with it all of the time. 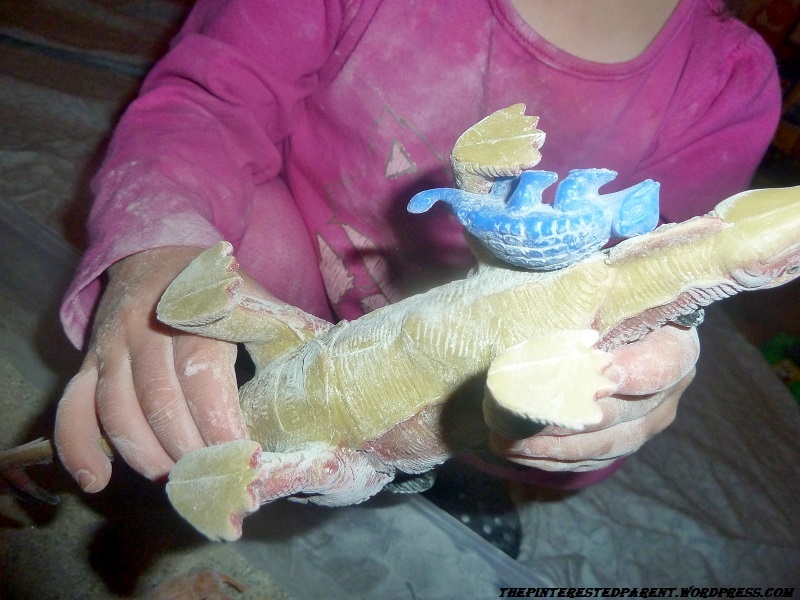 The whole family loved playing with it. Unfortunately, since our move, we have been unable to find it. 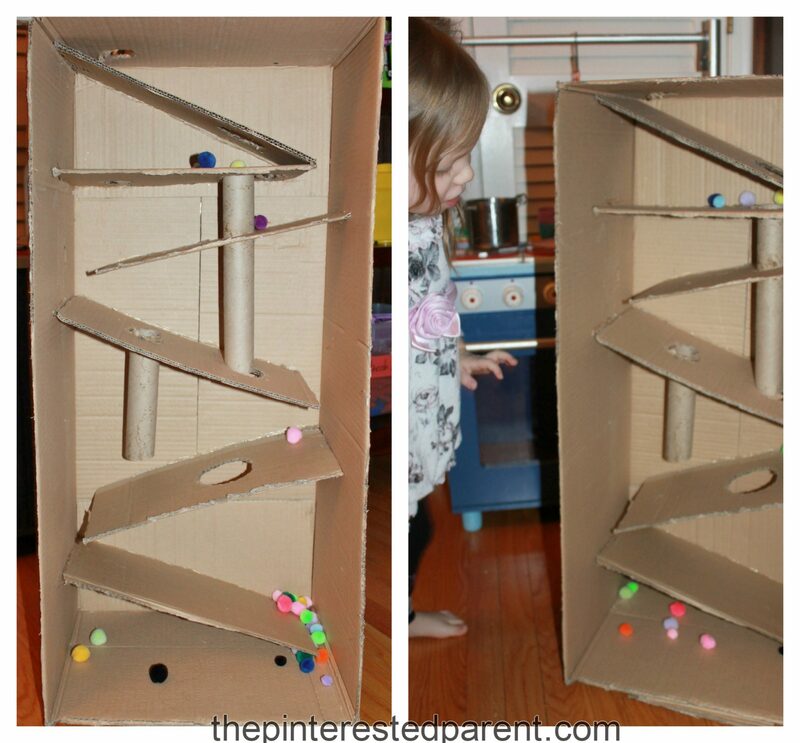 I have seen a number of homemade marble runs made out of cardboard tubes, straws & even Legos & I thought we could try our hands at our own while we searched for our missing one. We used a large cardboard box. We cut the flaps off of one side to leave one side wide open. We used the flaps to form our ramps. 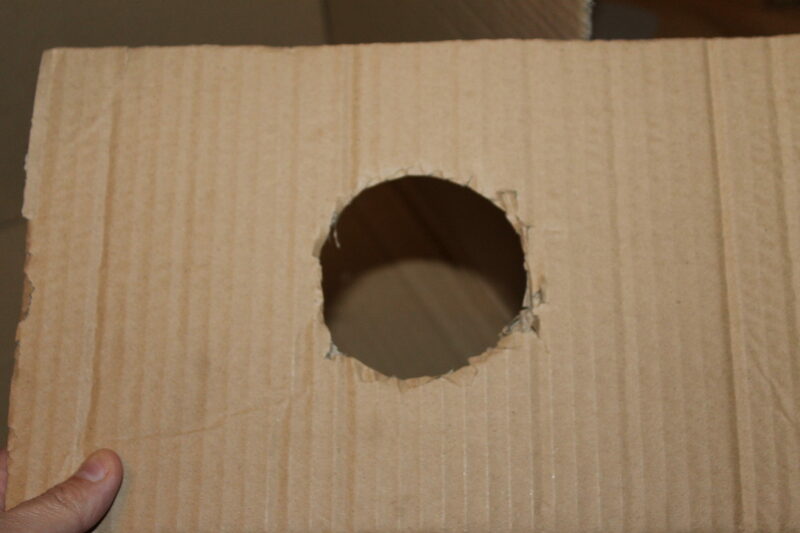 I wanted to add different options & obstacles to the ramp so I cut a hole or multiple holes into each piece of cardboard. 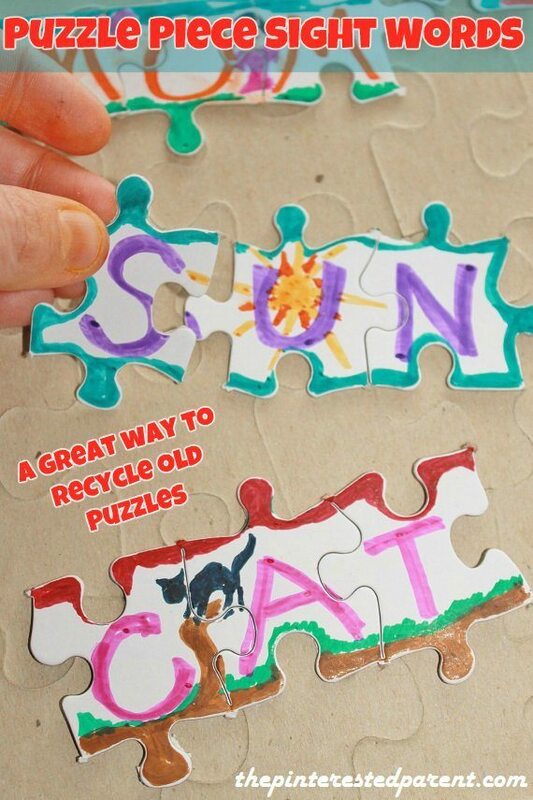 I used a glue gun to glue the cardboard pieces in place at an angle, making sure to leave space on the bottom end of each piece for the marble to be able to drop. 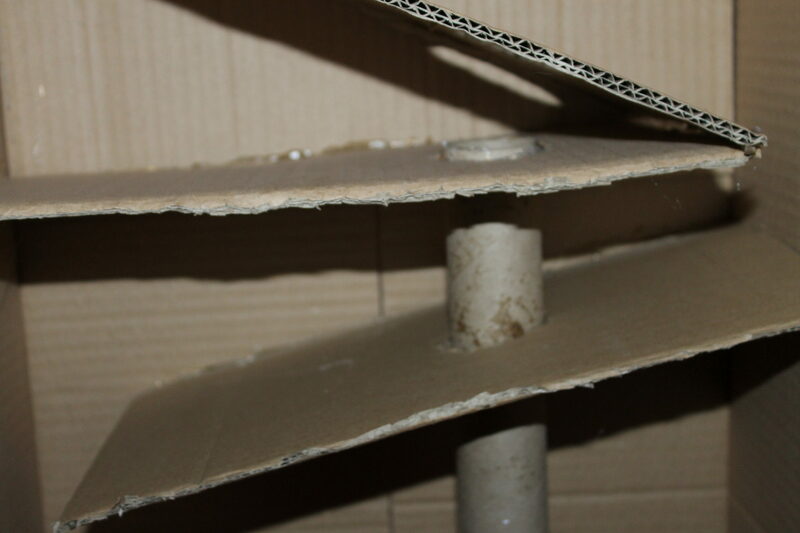 I used plenty of glue around the edges to hold the ramp pieces in place and used cardboard tubes in a couple of areas for additional drop options. 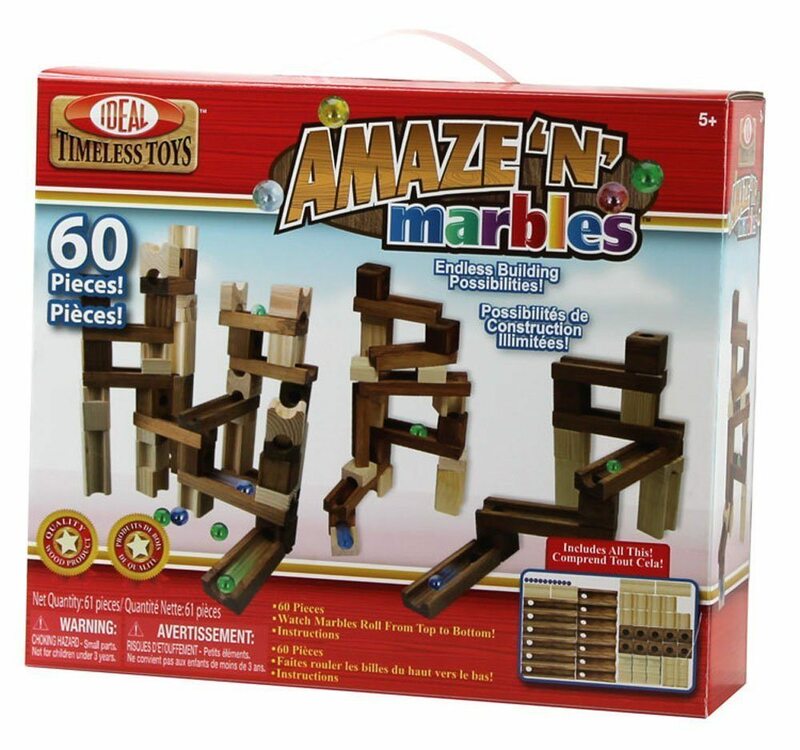 We tested it out a couple of times & found that our marbles fell forward a few times, so we glued a couple of extra scraps of cardboard under the bottom front to balance it out. 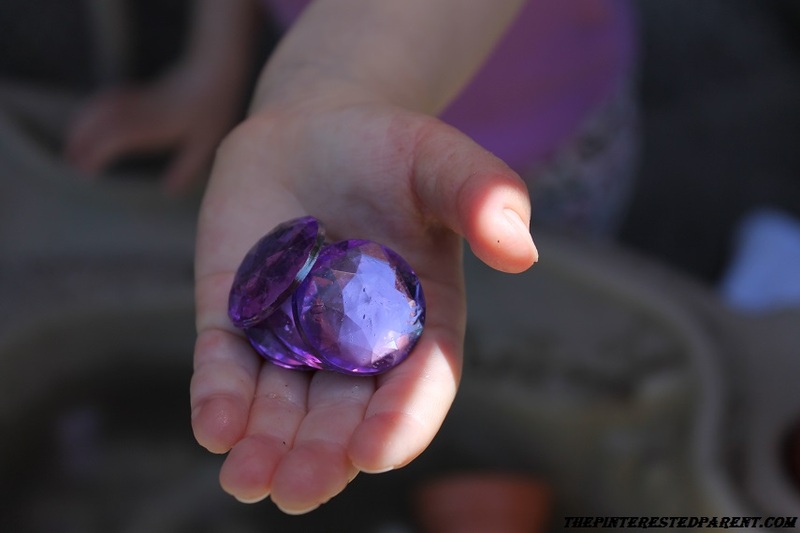 We used the marbles, but then found that a handful of poms poms was just as fun. 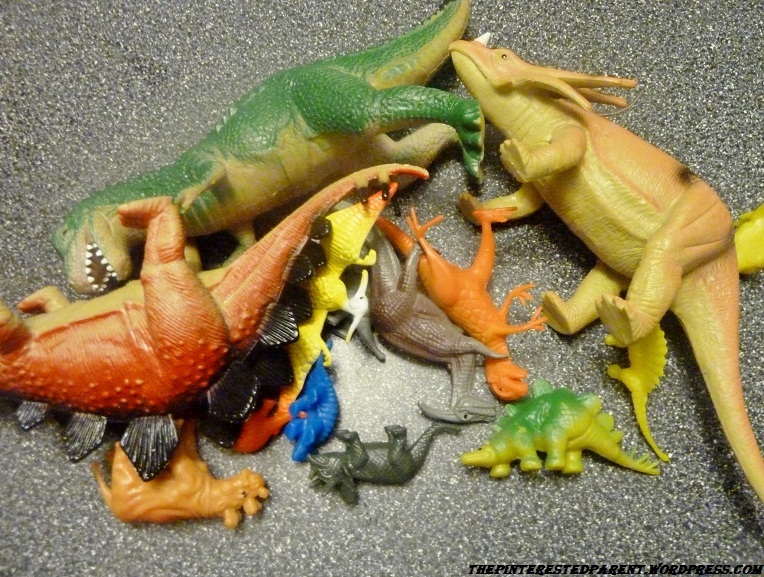 My daughter likes dinosaurs. She really likes them. I think this is largely because of the book ‘How do dinosaurs say goodnight?’. 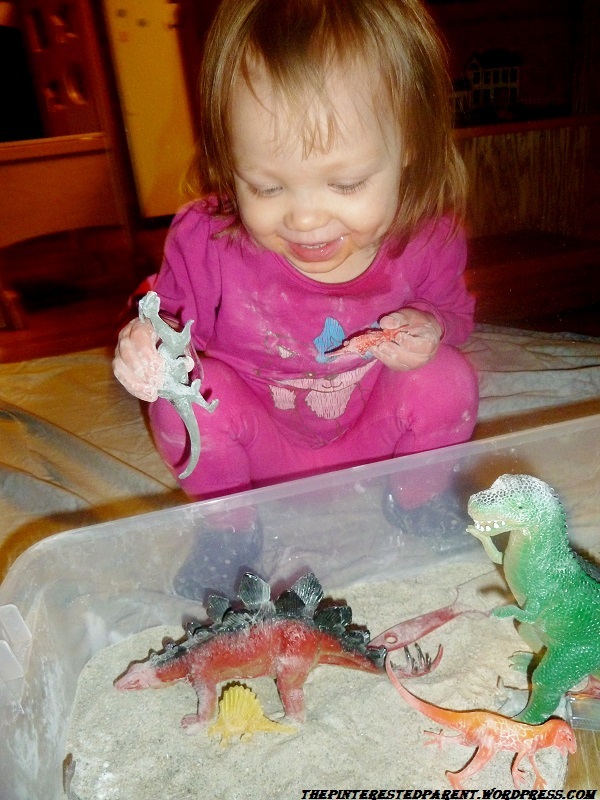 I am not sure, but regardless, she loves those crazy creatures. A few weeks back I took her to a dinosaur exhibit. She of course loved it. 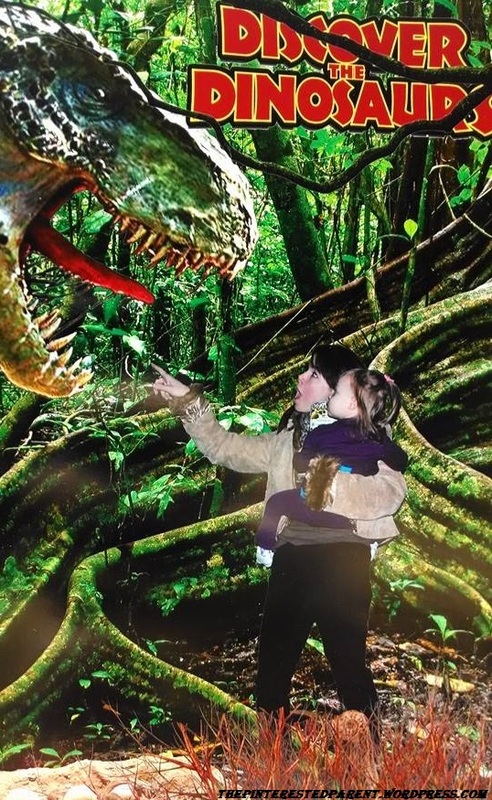 There was a wide range of dinosaur related displays, rides & activities. 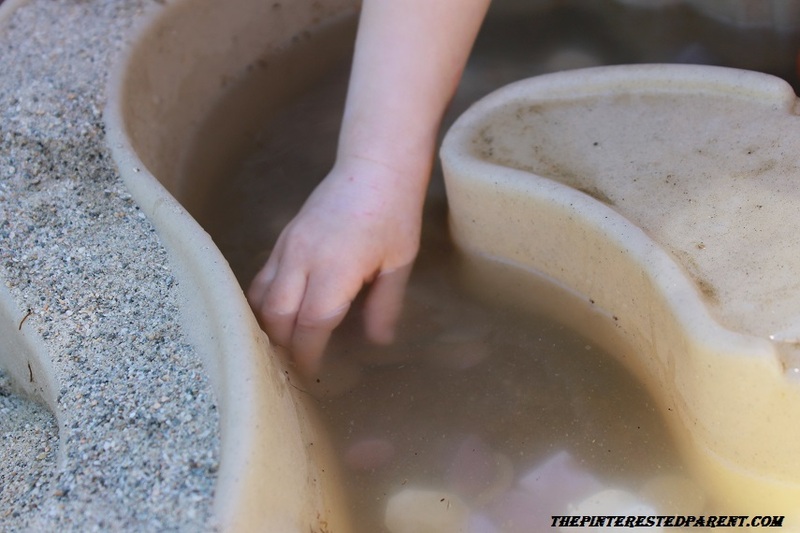 One of the kid’s activities there was a sandbox with fossilized rock at the bottom. 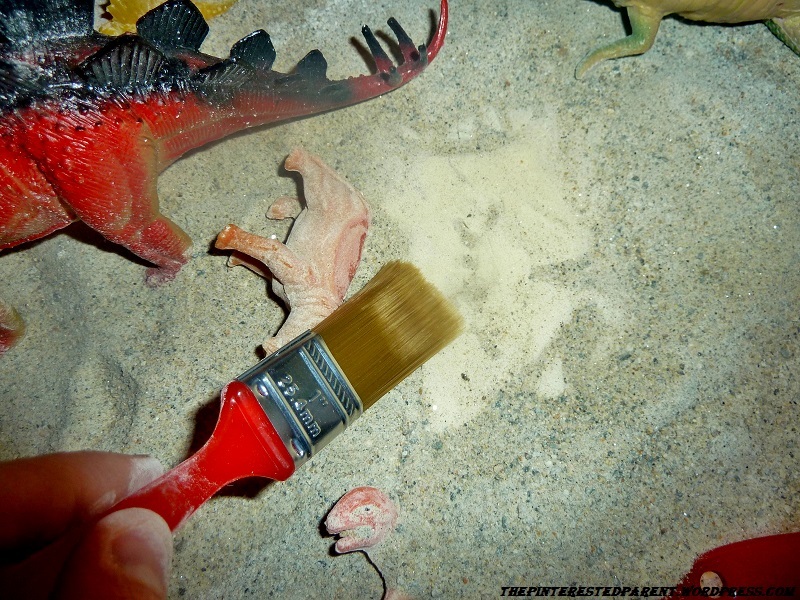 It had paint brushes to brush off the sand to uncover the fossils. Mai really enjoyed this. 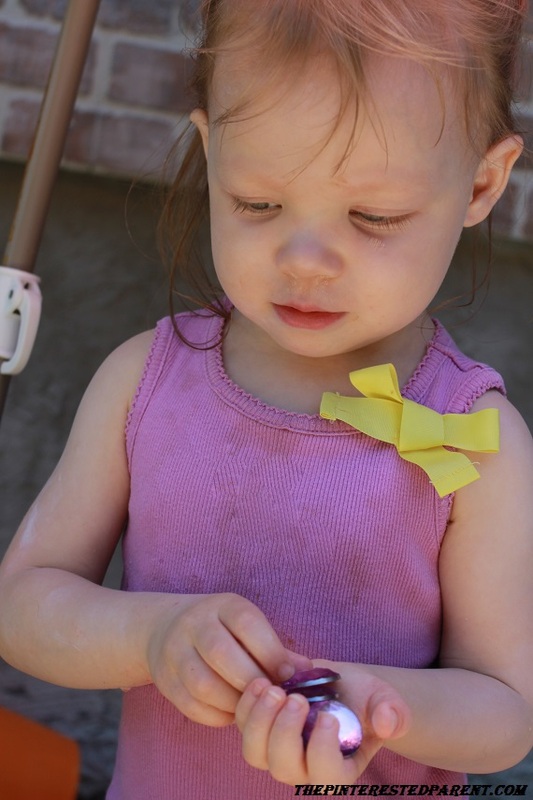 I thought this would be an easy enough activity to make a home. 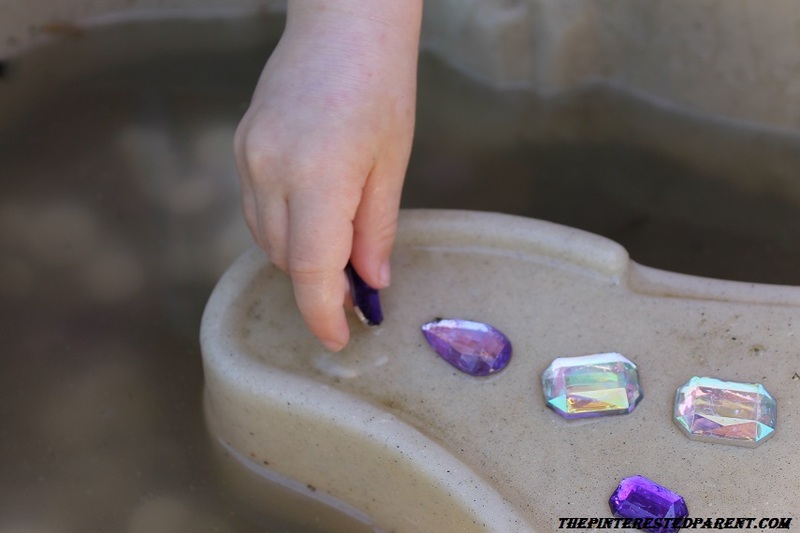 It took a few weeks, but today we finally tackled this sensory box & the results were great. 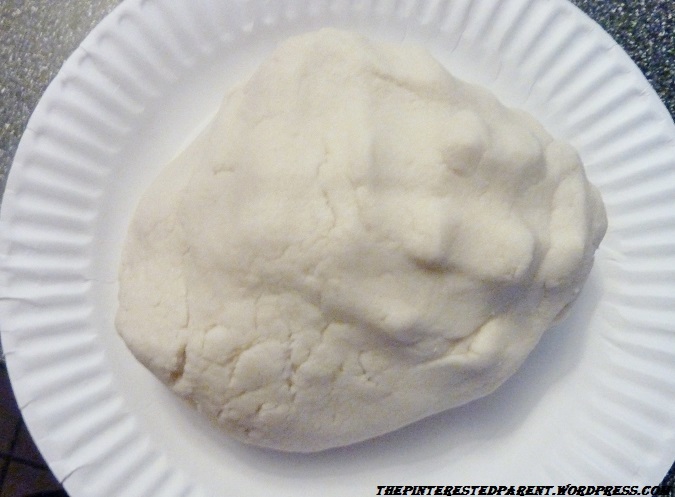 Get your molding clay ready. 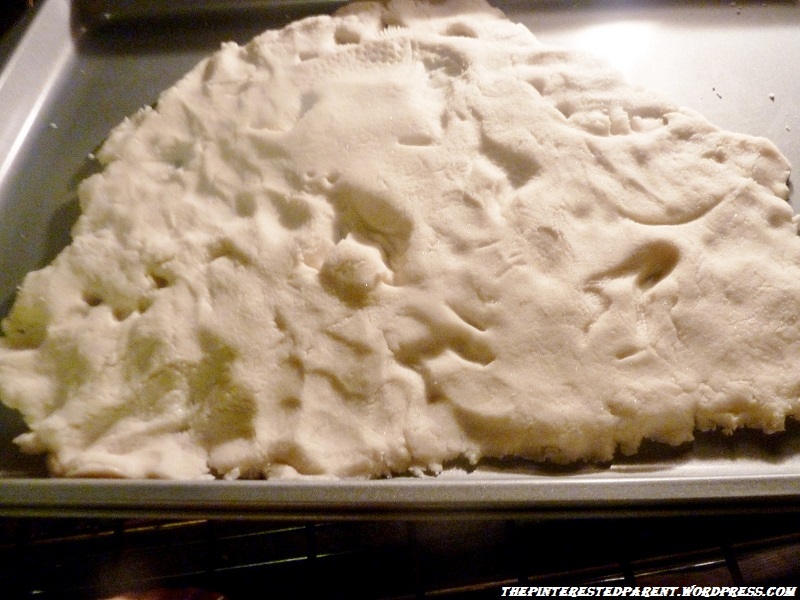 Knead & roll out to the desired shapes. 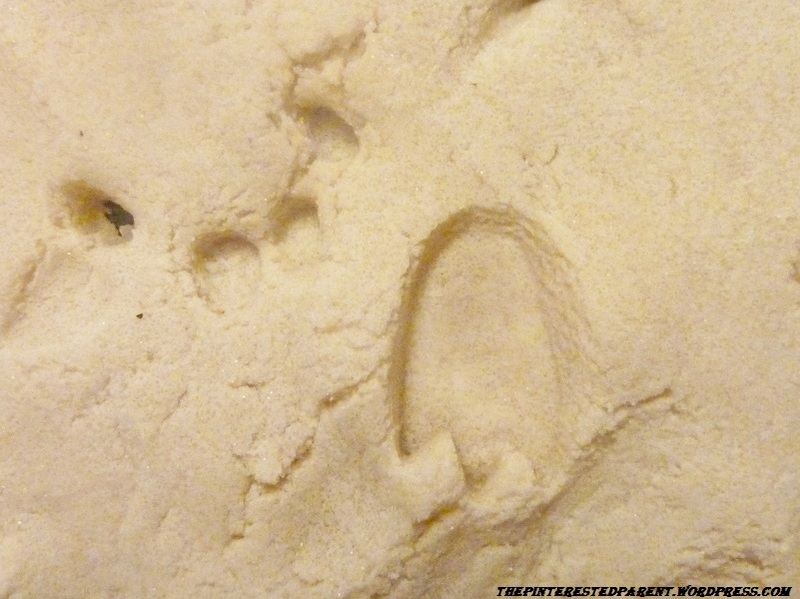 Using your dinosaurs make imprints into the clay with their feet & their bodies. 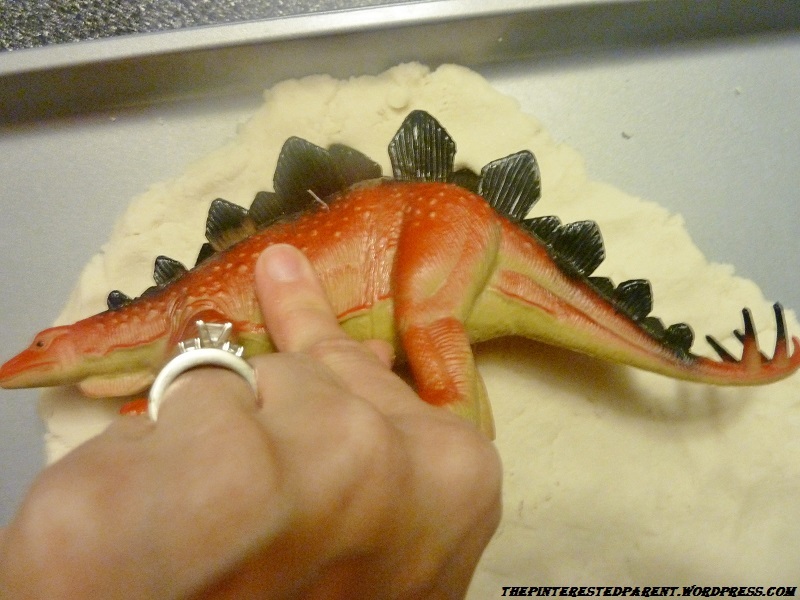 Let your clay harden according to it’s recipe directions or package directions. 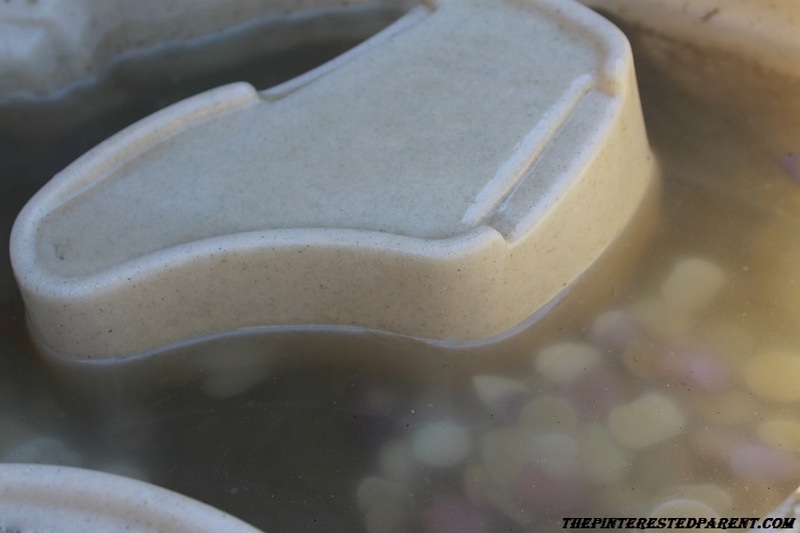 Once your imprinted clay is hardened & cooled, place at the bottom of your Rubbermaid container. 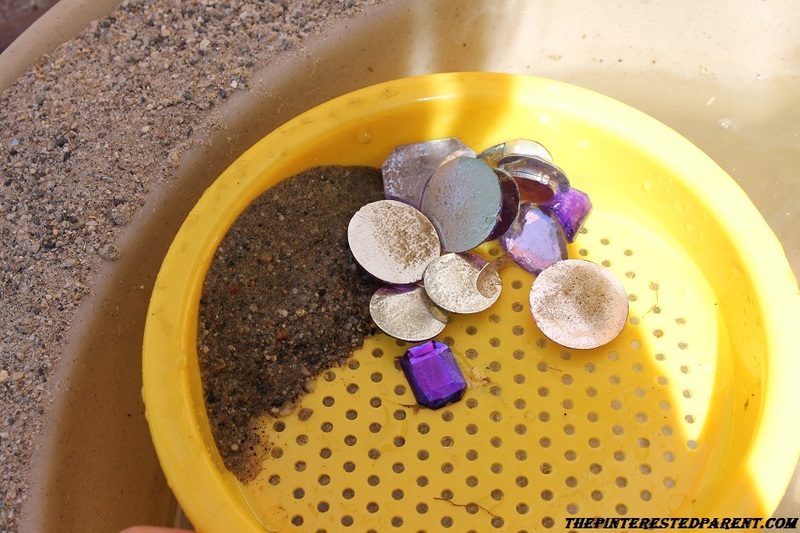 Pour play sand on top of your clay imprints. 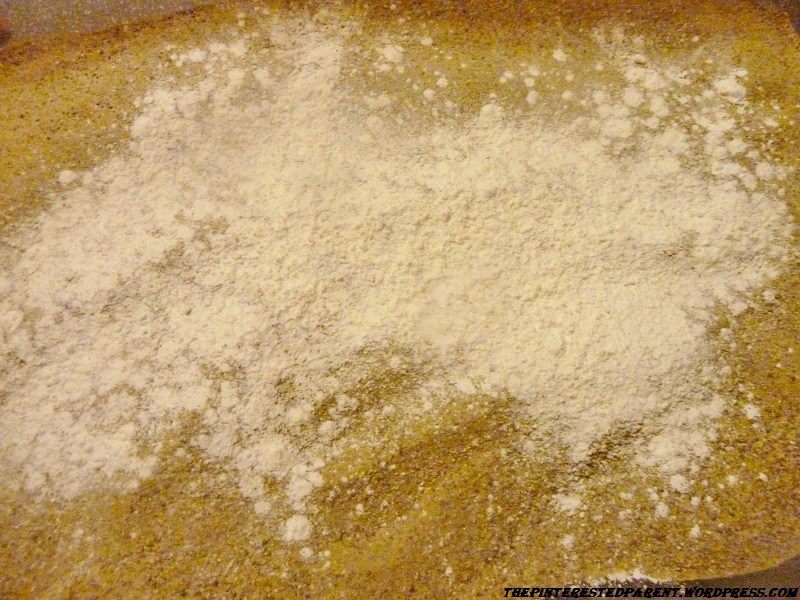 I mixed the sand with cornstarch to lighten the texture of the sand. 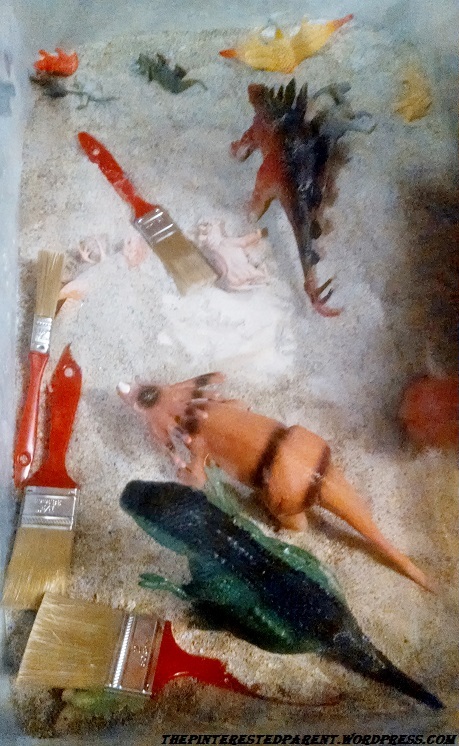 Add your dinosaurs and paint brushes. 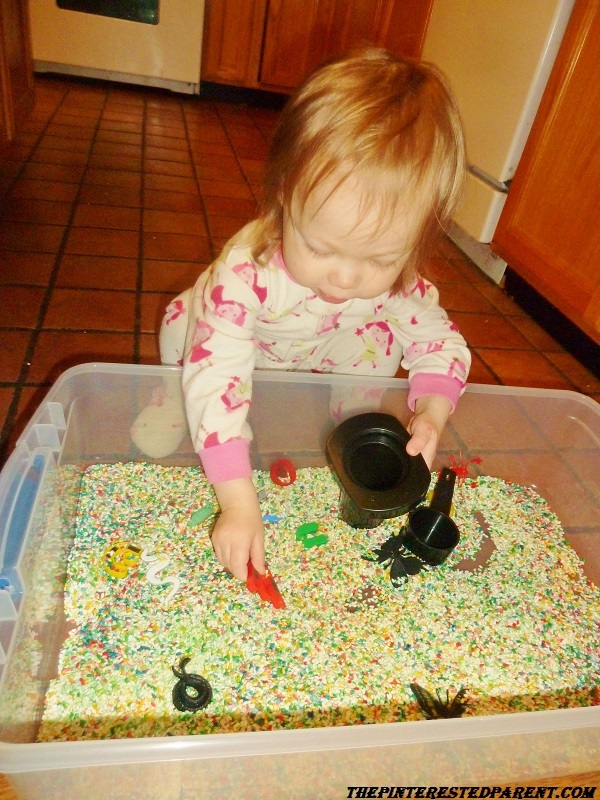 Lay down an old sheet or drop cloth to collect any sand that may escape. 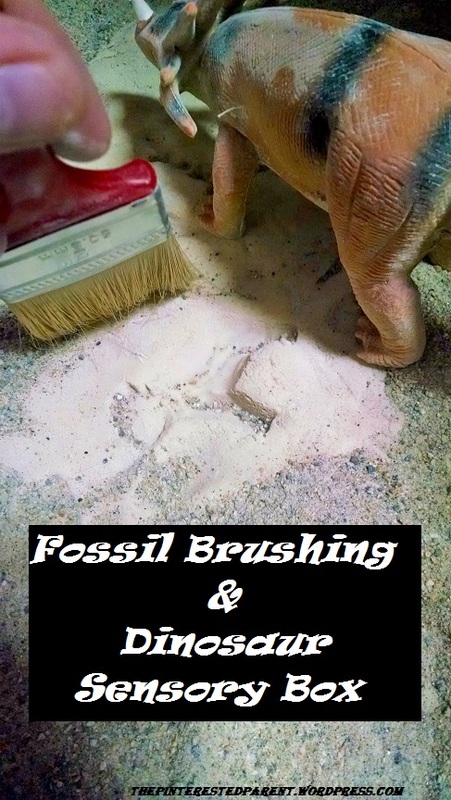 Brush the sand & reveal your fossils. 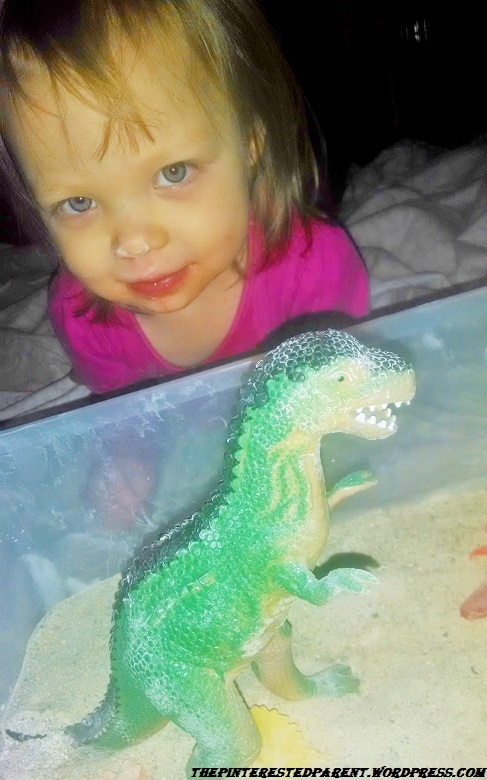 My adorable daughter is showing me the mama dinosaur holding her baby dinosaur. So cute! 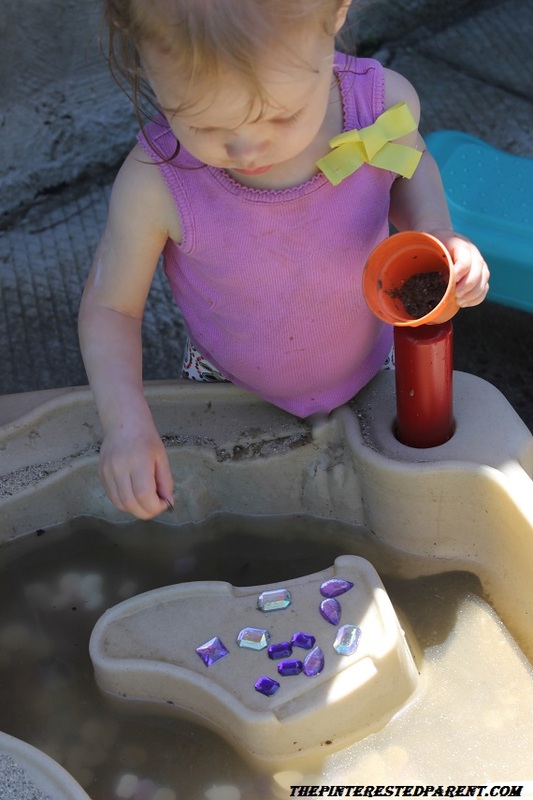 Mai loved this activity. 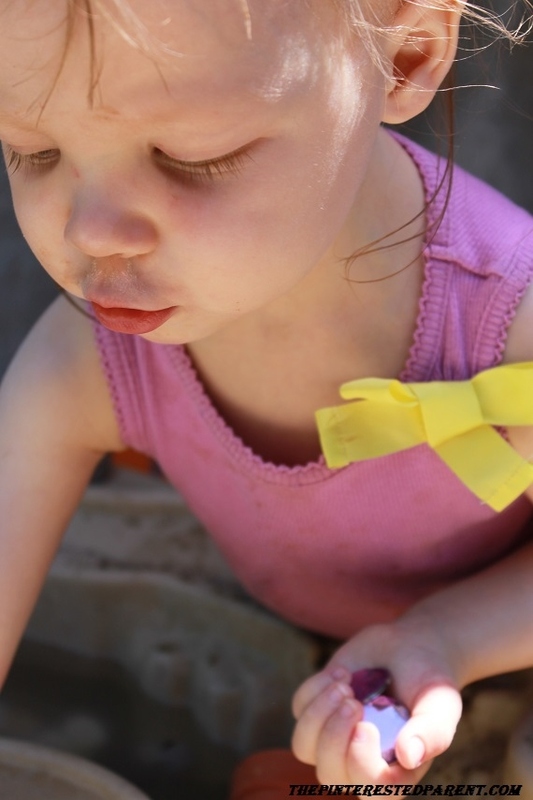 We played with it after supper & up until bath time. 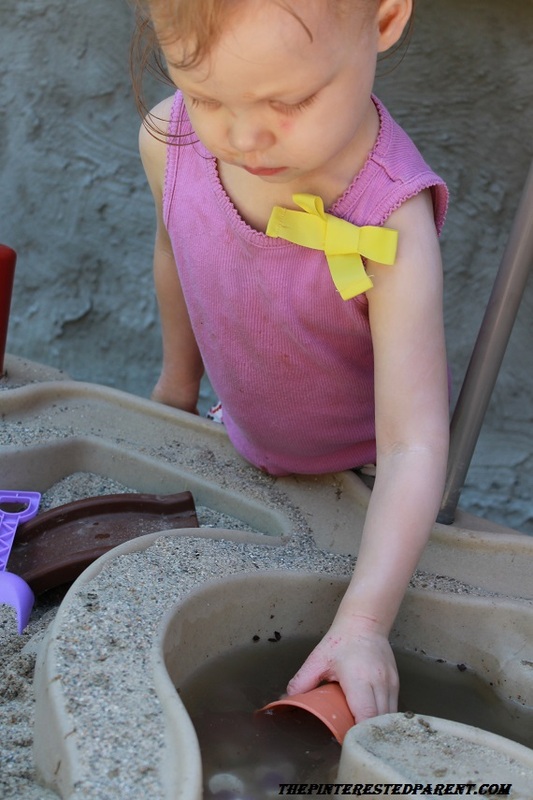 She was so deep into her new role as archaeologist that mommy was able to bake, do the dishes & pick up all of her toys. It was a good night. 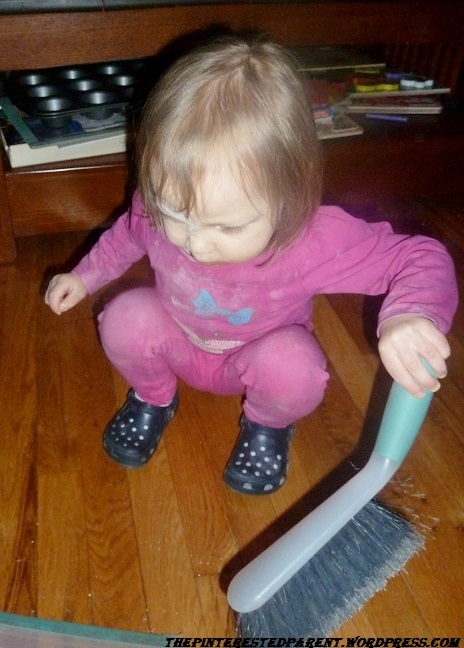 Mai even helped mommy sweep up after.